Summary: The description, specs, pricing, photos and user ratings for the Cabot Guns National Standard pistol. 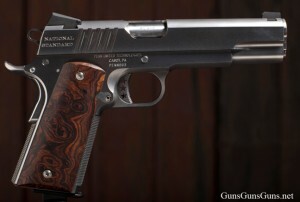 The Cabot Guns National Standard is a 1911-style semiauto chambered in .45 ACP and built on a 420 stainless steel frame with a 420 stainless steel slide. 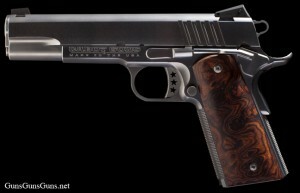 Features include striping on the slide and a stainless-steel trigger pad dubbed the “Tristar” trigger. Unlike other trigger pads which have a flat front, this trigger sports a rounded front and knurling on a rounded and radius component. 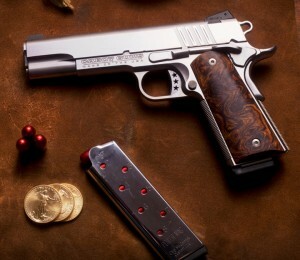 This entry was posted in .45 ACP, $5,501-$6,000, 1911, Cabot Guns, Full size, Semiauto on February 9, 2012 by Staff.